The 790 Adventure has a different front fender, mounted closer to the wheel, while retaining enough clearance from the tyre for light off-road use. The ‘R’ has an enduro-style mudguard, mounted under the headlight for maximum clearance. The 790 Adventure is available in orange or white versions, with the ‘R’ a combination of orange, white and black. Aside from the graphics differences, the ‘R’ also features orange hand guards and black rear panels, as opposed to black and white, respectively, on the Adventure. Rear pillion handles (integrated into a luggage rack) come installed on the 790 Adventure, but are also supplied with the Adventure R.
The ‘R’ uses a shorter design in a tinted finish to allow for less restriction when riding off-road while standing up, as opposed to the larger, transparent design employed by the 790 Adventure. Each screen’s height can be adjusted over a 40mm range (by way of the Allen bolts) and are interchangeable between models. This is the biggest difference component-wise and to the riding character between the two bikes. The 790 Adventure uses a split-fork design (rebound controlled in the right tube, compression in the left) with an Apex shock absorber. Apart from rear preload, these Apex suspension components are not adjustable. The 790 Adventure R’s fully adjustable WP Xplor fork and shock is the result of an extensive testing program to help it meet the design team’s philosophy for the bike: to be “the most off-road capable Travel Enduro bike with true street comfort”. The R has 240mm of suspension travel, compared with 200mm on the standard version. 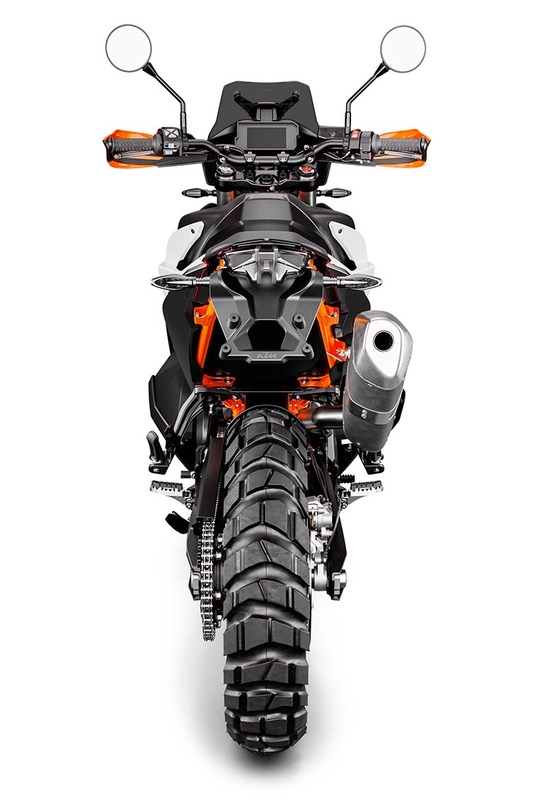 Physically, the chassis and swingarm are identical on both bikes, but the main frame and subframe are painted black for the Adventure and orange for the Adventure R.
To suit its more off-road focus, the ‘R’ has slight geometry changes: wheelbase of 1528mm (compared to 1509mm), steering head angle of 63.7° (compared to 64.1°), trail of 110.4mm (compared to 107.8mm) and benefits from a ground clearance of 263mm (compared to 233mm). The design of the seats differs for the intended use. The Adventure runs a split design with a pronounced step to separate rider and passenger. The rider’s seat is easily height-adjustable (between 830mm or 850mm) and features an under-seat phone pocket (USB charger also available as a KTM PowerPart). Note that an official lowering kit is also available for the 790 Adventure (that brings the seat height down to 805mm). The R has a seat height of 880mm and uses a one-piece design with only a small bump stop to allow maximum movement on the bike for a variety of riding situations. Both seats are compatible with each model, and multiple KTM PowerPart options include: Ergo seats in standard (with three stages of heating control), and +20mm and -10mm heights. Both bikes feature a comprehensive suite of electronics, but only the Adventure R comes with the new Rally ride mode installed (it’s an option for the 790 Adventure). Both models are navigation-ready, thanks to KTM My Ride, only requiring an app for onscreen, turn-by-turn directions. Further options for both bikes include the Quickshifter+ and cruise control. To give riders the choice of what rubber they want to fit, without changing their wheels, identical tyre sizes are used on both bikes. The 790 Adventure is fitted with Avon Trailrider hoops – a road tyre in an off-road size that provides excellent street handling. To suit its more off-road orientated attitude, but still offer street performance, the R wears Metzeler Karoo 3 kicks. Following their official unveiling at Milan’s EICMA show last November, both 790 Adventure models are scheduled to arrive in Australia in June, 2019. KTM Australia has confirmed that the 790 Adventure R comes with a $22,695 (Ride Away) price tag, while 790 Adventure will retail at $21,195 (Ride Away).